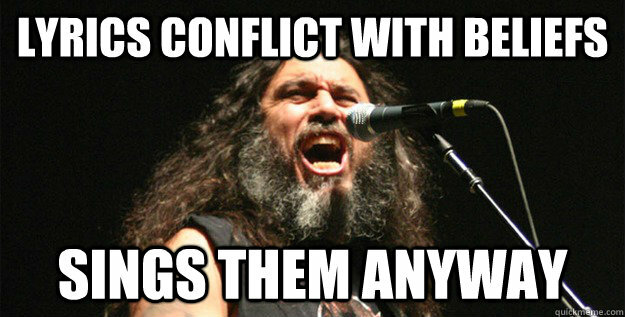 When Slayer began 1981 I told the guys that I would not sing songs against my own Catholic beliefs. In turn, Kerry and Jeff assured me that they would not force me to do that. I stayed in the band on the condition that we would be a totally belligerent Catholic metal band hostile to Satanism and disdainful of atheism. Plus, the guys promised me pizza every night, ha ha ha! At that time, my English was not as proficient as it is now and I did not really understand what I was singing, ha ha ha! So, imagine my surprise in 2015, when my English was a little bit better, I discovered that some people were interpreting our songs as Satanic tunes, man. Total anger, ha ha ha! I was in a blinding rage, ha ha ha! I am still fuming, ha ha ha! I told Jeff in 2015 that I was quitting because they had played me for a fool. Jeff did not respond to my comments because he had already died in 2013. I told Kerry that this Chilean always fights for one God and that's it, man. Just one God is all I need! Well, I mean, you know, it's three Gods because the spirit is one, the father is two and Jesus is three, but it's three in one. Like a three-layer cake, man. Hey, listen, do you have some three-layer cake with you right now? I could go for some cake right about now, funk soul brother. Anywho, the three Gods are like three compadres that always stick together. Muy bueno, amigo. That's God, man. It's one. Well, we also have the saints and the virgins and there's a boatload of saints and virgins and we pray to them, but it's not idolatry, man, it's cool, because they are good amigos with God. It's not a violation of God's first commandment against worshipping idols when you do it in the name of God. Anyway, what was I talking about, ha ha ha?! Ah, yeah, I remember now. I was telling you that some people thought that we were a Satanic band, which is ridiculous. What would give them that idea? We use pentagrams, we use blasphemy, we curse in our songs, we are obscene, we mock God, we praise Satan, we defend evil and promote violence, but besides that, why would anyone think that we are Satanic? Our first album had a Satanic goat and pentagram on the cover, but what's wrong with that? It's a goat! I grew up on a farm and goats are cool. They eat everything, they eat all day, like Kerry does. We also had a song called Black Magic, but we were just warning people about the dangers of black magic, man, you know, like Santana was warning people about manipulative and evil women with the song Black Magic Woman. We also had a song called Antichrist, but we were just getting the word out about how the Antichrist is coming. Personally, I believe that Limp Bizkit is the Antichrist, man. 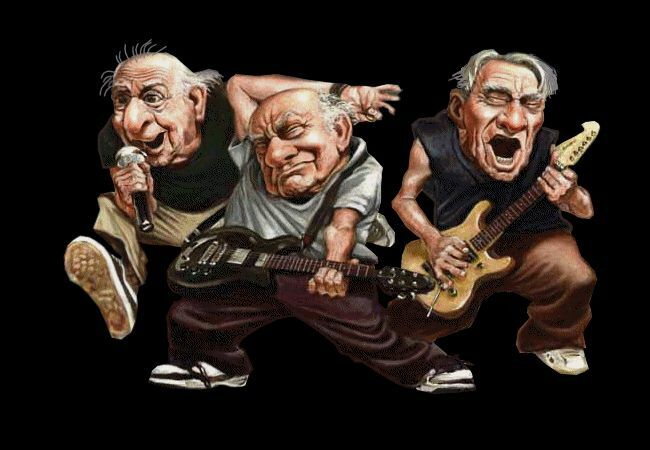 Rap rock was so infectious that it fooled us, too, ha ha ha! Remember our album Diabolus in Musica? Hey, listen, we are sorry about that album, ha ha ha! We thought that we could be heavy rap rock band, too, but it didn't work. Hey, so, what was I saying? Ah, yeah, so, then we also had songs like Hell Awaits and my goal with that one was to tell our fans to get right with God or else, you get what I'm saying? The song Jesus Saves was me just speaking truth. The title says it all, ha ha ha! For years, I thought that I was telling the world about God and people think I was doing the opposite. I know who's to blame, ha ha ha! It's that bald fat head Kerry! He just kept writing those songs and he played me like a chump, but I got even because I slapped that chubby cat upside his bald head so hard that I knocked his sunglasses off. He's such a stupid. He thinks his future is so bright he's gotta wear shades, but he's just a stupid. Now I am free, ha ha ha! I have left Slayer, which means I left Kerry because there's no band to leave. It was Kerry and Tom and the hangers-on. Now I will dedicate myself fully to God. I have written songs already. The band is called Hell Awaits and our first tour will be straight up old school: we'll play outside or near Catholic Churches or Catholic Schools or Catholic Pancake Breakfast Houses. It's going to great. I feel so free! I want nothing that reminds me of Slayer again, ha ha ha! Hell Awaits. This one tells young people to be thankful for being alive. It’s to remind them that the vast majority of people will go to hell, like The Bible says. Antichrist. This little ditty is all about end times and the time when the Beast will rule. It's a positive song. Divine Intervention. With this one we want the youth to understand that God is everywhere, including in the hearts and minds of stupid young people who think that they will live forever. Die by the Sword. This track is about the mercy of God. If you commit a sin, God will punish you with death. You want to live a violent life, you will die a violent death. God is peace. Jesus Saves. This song is one of my faves. Jesus will save everyone! Well, not literally everyone, but everyone who is a true Catholic. Everybody else will suffer a long and painful death in a lake of fire and brimstone. God is merciful and peaceful! Raining Blood. This is a prophecy about how God will punish the human race through mass death from the sky. Glory be to God! God Hates Us All. This one tells the story of how the sinners are angry at God, but ain't no need to be angry, atheists, you just gotta do right. God loves everyone, as long as you are Catholic. Otherwise, yes, he hates you all, that's true. My new band has more songs, but you get the picture. This is where we are headed. Jesus Saves! There is no other way, ha ha ha! (Makes the sign of the cross) Hell Awaaaaaaits the atheists!